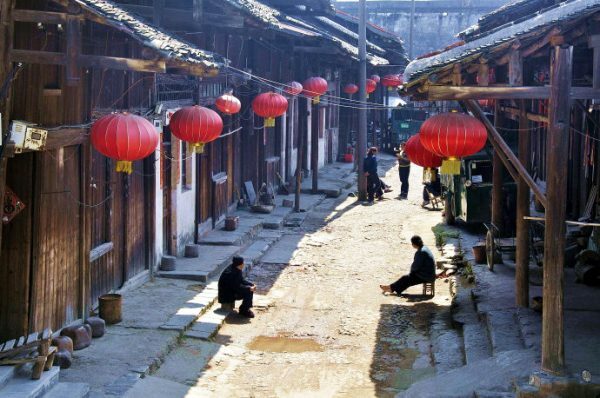 Daxu Ancient Town is like a small pearl nestled on the bank of the Li River. Although it is considered one of the Four Great Ancient Towns of Guangxi, it rarely receives visitors and has yet to be officially made into a tourist attraction. This means that, unlike other ancient towns, it is free to enter and there are hardly any crowds there to obstruct your unhindered joy of the fine architecture, flagstone streets, and locals plying their simple trade. Daxu Ancient Town is located on the east bank of the Li River, about 23 kilometres (14.3 miles) southeast of the city of Guilin. Its history dates back over 2,000 years, when Qin Shi Huang of the Qin Dynasty (221-206 B.C.) built the Lingqu Canal and connected the Xiang River from the Yangtze River system to the Li River. Once these rivers were connected, Daxu begin to blossom as one of the leading trade and transportation hubs in the country. Daxu was one of the few ports along the river that connected Central China with South China, so it was a vital stopping point for traders transporting goods across the country. By the Northern Song Dynasty (960-1126), Daxu was one of the richest and most influential towns in Guangxi province. Its success peaked during the Ming Dynasty (1368-1644) and this was when many of its landmark buildings, such as the ancient main road and the Longevity Bridge, were built. However, by the late Qing Dynasty (1644-1912), the development of modern railways had rendered Daxu redundant as a trade hub and its prosperity rapidly declined. Thanks to the tireless efforts of the local people, unlike the ghost towns on the Silk Road, Daxu Ancient Town has continued to survive and thrive well into the 21st century. 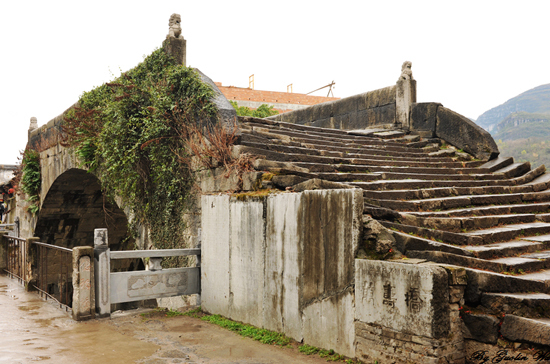 The Old Street, which stretches 2.5 kilometres through the town, is the greatest remnant of the town’s glorious past. It is paved with blue flagstones that have been worn smooth by centuries of footsteps, cartwheels and horse hooves. The thirteen docks that were once used during Daxu’s booming era of trade still stand and five of them are so well-maintained that they are still in use today. As you traverse the Old Street, walking along the same path that so many before you have tread, and reach the fine docks with their simple, wooden platforms, you’ll undoubtedly be transported back to a humbler time, when merchants dressed in silk finery would load their boats with spices, embroidered cloths, and shimmering jewellery, and set sail down the river to the next trade port. Many of the buildings in Daxu were built during the Ming and Qing dynasties and have sustained the intricate, architectural touches from that time. These wood and stone buildings are decorated with beautiful carvings and the Hanhuang Temple, Gaozu Temple and Longevity Temple are the finest examples of this architectural style. All of these temples were built during the Qing Dynasty, when the town was still prospering, and they exquisitely exhibit the artistry of the architecture at that time. With so many temples in one small place, it is no wonder that Daxu seems so tranquil. However, the star attraction of Daxu is undoubtedly the Wanshou or Longevity Bridge. This stone arch dates all the way back to the Ming Dynasty and, though simplistic in its design, it provides a wonderful vantage point from which to admire the Li River. If you stand on Longevity Bridge and look out to the west bank, you’ll be greeted with scenes of lush greenery, winding waters, and water buffalo quietly grazing on the shores. Directly across from the bridge, you’ll be met with Millstone Hill and Snail Hill, two of the Karst formations whose names derive from their unusual shapes. Though the architecture of the Longevity Bridge may not be as magnificent as that of the Longevity Temple, the view from the bridge is unmatched. In the 1990s, an element of mystery was added to Daxu Ancient Town when archaeologists unearthed what are now known as the Seven Star Tombs. These are seven tombs that were found arranged in the shape of the Big Dipper constellation. The size of each tomb is based on the brightness of the star it was meant to represent. It is the first recorded case of such a tomb site in China and the connection between the tombs and the Big Dipper constellation has yet to be elucidated. However, many ancient artefacts, such as pottery and bronze swords, have been excavated from the tombs. Thanks to carbon dating, these artefacts have shown that these tombs date all the way back to the period between the Warring States Period (c. 476-221 B.C.) and the Western Han Dynasty (207 B.C.-25 A.D.). Aside from the historical importance of Daxu, this town is also a wonderful example of living history. Many of the villagers in Daxu all ply their own traditional handicrafts. The women of Daxu still brew their baijiu using old barrels and a simple distillery, an archaic method for making baijiu that has all but disappeared in more urban parts of China. The locals still craft their bamboo baskets and straw sandals carefully by hand and the traditional Chinese medical clinics, of which there are about 20 in Daxu, still disseminate an aroma of medicinal herbs and traditional remedies throughout the town. Daxu is not simply an ancient town; it is a place of ancient tradition. To truly immerse yourself in these ancient traditions, we recommend you wander through the streets during market time. This market has been a staple part of daily life in Daxu since the Ming Dynasty, although it has grown smaller over the years. Many villagers will each set up a stall, some selling handicrafts, such as paintings, ceramics or woven cloths, other selling Chinese medicines, and still others plying local delicacies such as quail’s eggs, dried fruit and homemade dumplings. The market is a spectacle of ancient Chinese culture that should not be missed. If you want to immerse yourself in the more rural life of Daxu, some of the local farmers will allow you to go fruit picking on their land. Picking strawberries near the Li River is a wonderful way to while away a few hours and harvest some delicious snacks in the process. Daxu Ancient Town is relatively easy to get to. There are regular buses from Guilin Bus station that take about 40 minutes to reach the town. Baijiu: It literally means “white alcohol” or “white liquor” in Chinese. It is a strong, clear spirit that is usually distilled from sorghum, glutinous rice or wheat.